I heard on the news that a team of explorers is currently recreating Captain Scott’s doomed journey to the South Pole; there was a point on Friday, as I stumbled through the blizzard at an angle of about 45 degrees, pellets of snow peppering my exposed cheeks like dried peas, feet slipping on the ice, and wondering whether the tracks I was following were those of a Pekinese or a polar bear, that it occurred to me that they could have saved themselves the trouble and just come to Caithness for Christmas. We have, I am delighted to report, survived Scotland’s worst storm for over a decade, which struck on Thursday and lasted into Friday. Up in the mountains winds of 160 mph were recorded, but even at low levels winds of 70-100 mph weren’t unusual. Thurso’s Christmas tree blew over; Edinburgh had to close its German market; and (how cool is this?) a wind turbine actually caught fire. Margaret was coming up to visit on Thursday, and what should have been a tedious but straightforward journey of some 8 hours from Edinburgh to Wick became an epic trek through snowy wastes, flooded roads and felled trees, and which lasted over 30 hours (fortunately with an overnight hotel stop – not an option for poor Captain Scott). At least our power didn’t go out, though it was touch and go for a while as the lights flickered like closing time in the pub. On the gansey front, hopefully you can see the yoke pattern beginning to emerge; it has a resolutely chunky feel after all that plain knitting on the body. I’m particularly taken with the central star – I’ve never tried this kind of pattern before, and it’s really rather striking. 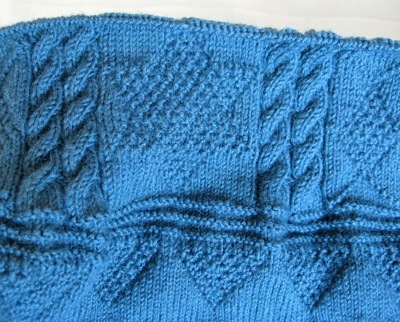 But of course you can’t go far wrong with a pattern that involves so many double cables. I’ve divided for front and back, which explains the rapid progress this week. Knitting the body while increasing the gussets is like walking across a muddy field; gradually you slow down as your boots clog with mud and it takes more and more effort to move forward. (I stopped when the gusset was 23 stitches wide, but 46 extra stitches per row can really slow you down.) Now I’m just working the back I can do a row in about 15 minutes, so it feels like flying, plus I have the new pattern to engage my interest. I’ve also just started my second 500g cone of Frangipani yarn, and I’m delighted to have got so far with no ends to darn in later. My only problem is that I forgot to bring up some differently-coloured yarn to use as stitch holders for the gussets. I could use some of the same yarn, but to be honest my eyesight is so bad that I’d never be able to get the stitches off again. So far the best I can come with is a strand of cooked spaghetti, but I accept that may not turn out to be the solution I’m hoping for. 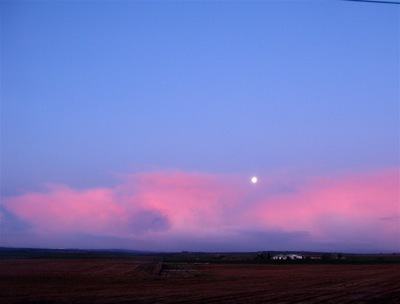 Hi gordon, pleased to hear that you weathered the storms.I did think of you when I saw the news & weather reports. I’m enjoying watching the gansey grow; the star pattern is very effective.My home-spun yarn gansey is progressing slowly and is now up to the yoke.It’s based on the Staithes pattern, but uses Betty Martin between the ridges as it shows up better with my not exactly consistent yarn.I’m learning lots about spinning as well as knitting with this project.All good fun! Batten down the hatches & keep warm. Regards Joy Davies. Lovely Humber star – this is growing nicely. 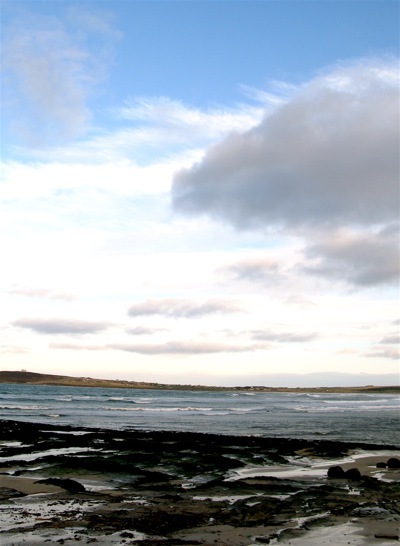 Hold on through the wind – we’re getting it down here too, but not so bad as there. The star is coming out very well. Would shoelaces work for stitch markers? Joy, Staithes is the pattern that keeps on giving. 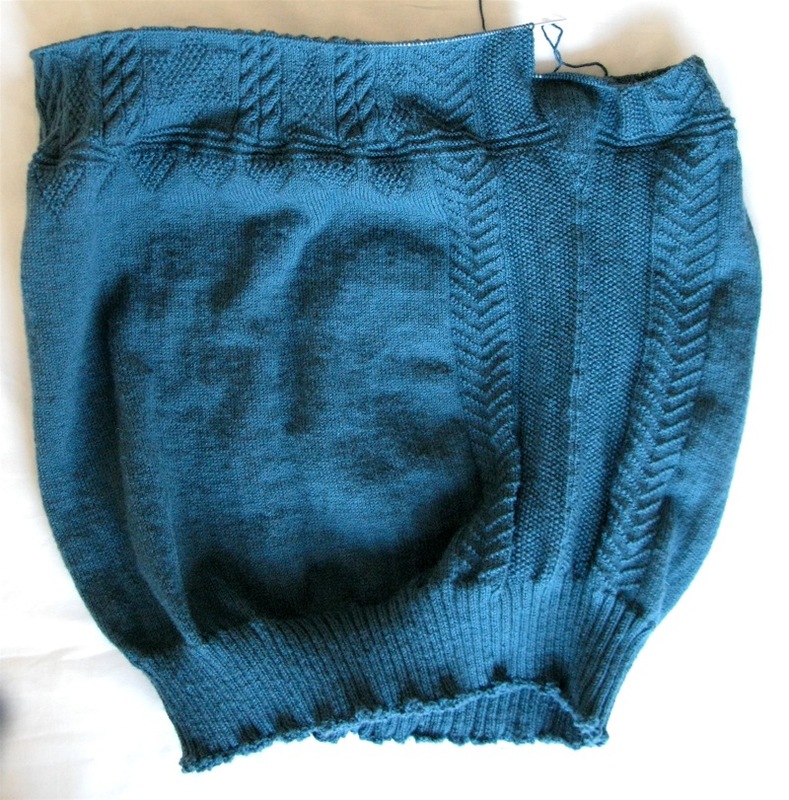 I love the “simpler” patterns, but I always feel that if I’m knitting for someone else I should do one with lots of cables – but my go-to gansey for everyday is the Henry Freeman Staithes-ish pattern. Spinning, though – that’s another matter! Alternative stitch holders: paper clips? Love the way this gansey is progressing Gordon and it’s making me itch to start another. A bit like childbirth, the memory of the trials and tribulations of completing my brother’s are fading fast but my fingers are just too darn cold to contemplate it at the moment. Down here on the east coast south of Aberdeen we didn’t have it quite as bad as you and Margaret up in Caithness but last Thursday’s gales blew the top off the flue to the central heating boiler at the point where it pokes up through the roof. To cut a long story short, the consequences of this have resulted in amongst other things having to have not just a new flue installed but a new boiler as well and re-routing of a lot of the associated pipework etc. The open log fire in the sitting room has come into it’s own but the surrounding chaos is not conducive to doing anything that requires concentration! Hopefully, all this work (including the repairs to the roof!) will be completed by the weekend and I can look forward to some peace and calm and being able to pick up the needles again. PS I find brightly coloured silicon ‘rubber’ bands make great seam markers – the sort that come in differnt shapes. The current lot I’m using are all different marine life – the dolphins are great because their beaks/noses sit on the needles just right! They fit nicely inbetween the stitches of even quite tight or fine knitting and slip easily from needle to needle as the work progresses. And the bright neon colours do mean that they are hard to miss! For second there I thought you were advising the use of dolphins’ noses as stitch holders, and the animal lover in me rebelled! Really sorry to hear about the wind damage – I know the east coast really caught it badly this time. Hope it all gets sorted out OK. I don’t know the silicon bands you’re using as markers (I’ve led a sheltered life) – is there a particular brand? Good luck with the flue! By the way, I read somewhere that holding papers together is not the main use of paperclips – top was being twisted to destruction by people as something to do with their hands, and second was extracting odds and ends from one’s ears… Not that you wished to know that, I expect. Once I can cross the moat of removed floorboards in the hall to get from the kitchen into the sitting room I’ll have a look at the packet for a brand name! Here was me thinking that they’d simply whip the old boiler out and put the new one in! No such luck – it seems to involve loads of new pipework and taking the panelling from the side of the bath off too. Original 1930s glass ‘Vitrolite’ which turns out to actually be very heavy so got dropped and which now has a huge corner chunk cracked off. It just gets worse! Floorboards back in place but more of the same tomorrow apparently before I have a working central heating system! However, Gordon I can now confirm that the brand of silicon ‘rubber’ bands I have is ‘Kikkerland’ but I’m sure that others make them too. You can probably get ordinary round ones too from any stationery outlet – but being silicon they are much longer lasting than traditional ones and don’t lose their stretch and perish. I also use them on bags of food destined for the freezer when I run out of ‘klippets’ and they seem to survive that too and remain re-usable. What about dental floss for stitch markers? I used it for a life line in a lace shawl I made and it worked a treat. That sounds a nightmare, but I guess any boiler/pipe replacement is going to be disruptive. Small comfort, I know, but at least it’s not as cold as last winter!